Fortuneis partnering with Placements.io as it rebuilds its adverting technology stack from scratch. It left Meredith’s platform after being acquired by Thai businessman Chatchaval Jiaravanon. Placements.io will serve as Fortune’s revenue management platform. The Seattle-based start-up works with publishers and ecommerce partners. The company offers integrations with Salesforce, NetSuite, Google Ad Manager, as well as a proprietary migration automation tool, allowing publishers to quickly migrate to Placements’ platform. “Fortune has been granted the opportunity to reinvent our business and partner with a progressive company like Placements.io, which positions us for success,” stated Michael Schneider, Chief Revenue Officer at Fortune. Placements.io says it has signed on more than 30 brands that have left competitive platforms in the past six months. The company also works with News Corp, among other partners. Fortune hired Jonathan Rivers, its first Chief Technology Officer earlier this month. He is tasked with building premium products at the business-focused media brand, as well as leading the development of products for Fortune across its digital, live events and print businesses. Fortune Media Group became part of Meredith Corp. after it bought Time Inc. in 2018. At the end of last year, Meredith sold the publication to Jiaravanon. “After the sale, Fortune only had an executive team and journalists,” Rivers told Publishers Daily a few weeks ago. The 89-year-old media company had “no infrastructure,” because it had lived on Time and Meredith’s platforms. “We have a website, but it has to get migrated out of Meredith’s infrastructure. A lot of the marketing stack and online advertising stack has to be built from the ground up,” he said. 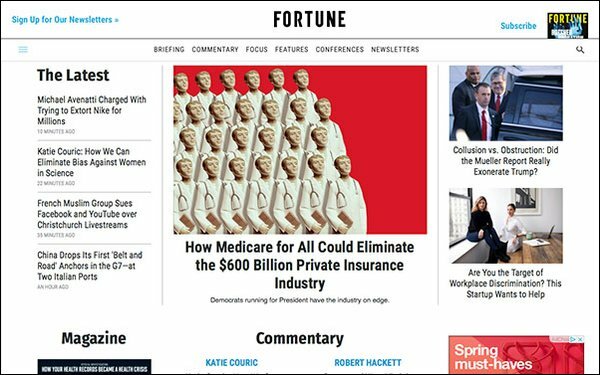 Fortune claims a combined audience of more than 20 million readers in print and online.